Immediately after the suburban white kids enter the house, they realize they're trapped inside and there's no way out. When a filthy, deformed, impossibly enormous man confronts them wearing a diaper made from trash bags and slashes one of the teens right on the spot, each of the kids runs off in a different direction in an attempt to escape the violence. In a nearby house just down the street from the boarded-up house of horrors, an old man named Perry watches the scene unfold. He then invites the group of black teens into his home, where Perry and the teens devise a plan to enter the house of horrors and rescue the suburban white kids. After all, nobody who's ever entered the mad house has ever left, and it's time to put a stop to the madness. Inside the "Urban Gothic" house, each of the five remaining teens are literally running for their lives. It turns out that the house is inhabited by a large family comprised of terrifying, deformed creatures who have never seen the light of day, and live in the sewage under the house. 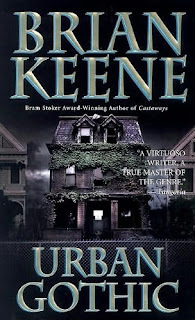 Brian Keene writes some of the greatest splatterpunk I've ever read. The story of Urban Gothic takes place in one evening, so the novel is incredibly fast-paced and addicting as a result. Urban Gothic is super disgusting; throughout my reading, I couldn't help but repeatedly put myself in the teens' shoes and think about what I would do and how I would react in their situation when it came to survival. I think Keene's characters did a pretty damn good job of defending themselves as best they could in this novel. I think my favorite part of Urban Gothic was when one of the girls battled deformed baby creatures in the "nursery." I loved Keene's descriptions of all the different freaks in the house. Urban Gothic is splatterpunk at its finest! Here's my review of Castaways by Brian Keene!